← Austin Meditation Group – Monastic Visit, April 11-13, 2014. 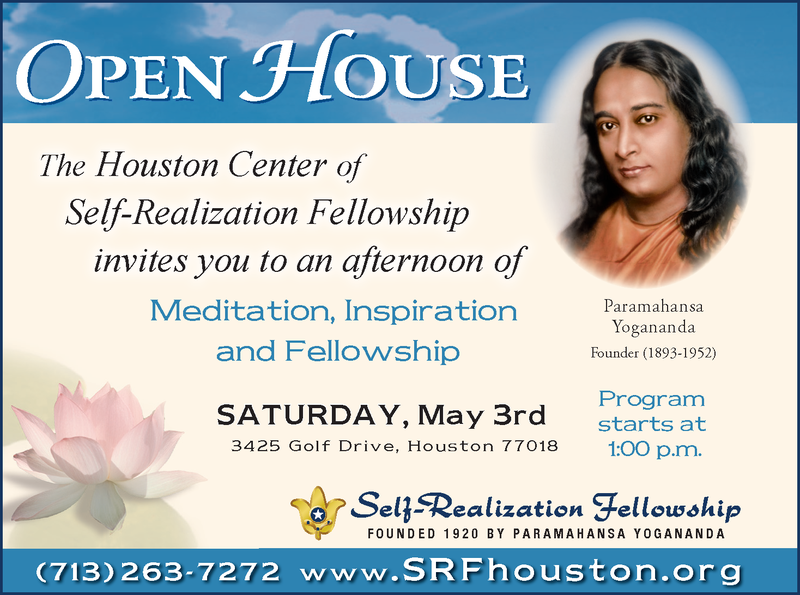 The Houston Center of Self-Realization Fellowship will be holding an open house on Saturday, May 3rd. 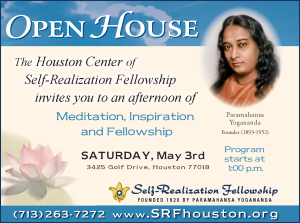 You are invited to bring all family and friends to introduce to the teaching of Paramahansa Yogananda, author of the best-selling spiritual classic “Autobiography of a Yogi”. The Open House will feature devotional chanting, guided meditation and a video presentation “Experiencing God Within”. It will be held from 1pm to 4pm at our location on 3425 Golf drive, Houston TX 77018. All newcomers will receive a welcoming packet enclosing literature excerpts from Paramahansa Yogananda’s writings and many additional items.